Since Chloe started full time school in September I’ve been looking for things to do with Amy to make the most of our time together. 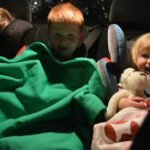 It would be easy to spend our days tucked up at home doing jobs, watching tv and playing but I’m keen to make sure that we have some plans which allow for the focused quality time which we may have missed out on when she was younger and I had Ben and Chloe at home demanding my attention. Of course we’ve been swimming with Puddle Ducks on a Friday since the start of the new school year but that still leaves us with two full days lacking in plans and routines so when we were offered the opportunity to try out a few lessons with diddi dance I jumped at the chance. We checked out the timetable and picked out a lesson which was relatively local (just over 6 miles away) and at a convenient time. Our lessons have been at 10am on a Tuesday morning which has worked really well for dropping Ben and Chloe off at school before making our way round to class. diddi dance classes are run and booked in half term blocks, each following a different theme; last half term was Bollywood and this half term is Jive. I was a bit gutted that we didn’t get to catch the Bollywood lessons I must admit – they sounded like great fun! 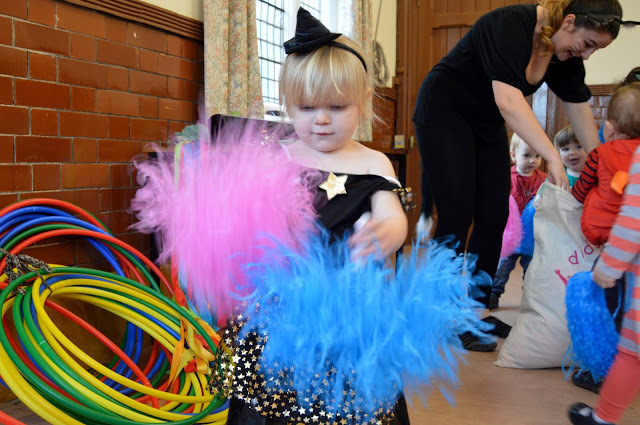 The structure of the 45 minute class is designed to work on your child’s co-ordination and rhythm and whilst you’re busy bopping away there are clear nods to developing “proper dancing” habits as time goes by with mention of first and second position, encouraging pointed toes with the “good toes / naughty toes” exercise. 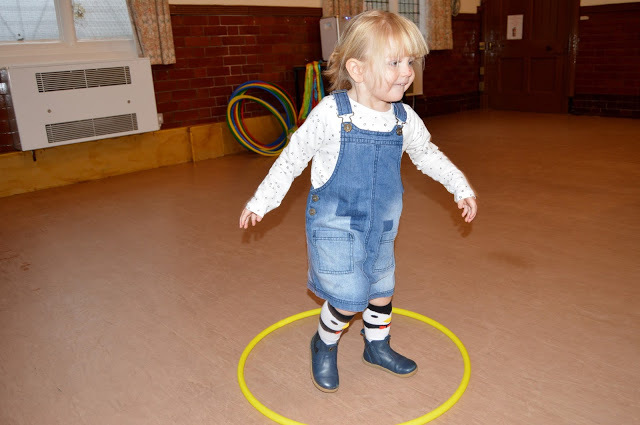 Each week there’s a mixture of familiar exercises such as the Circle Dance or the warm up and these are mixed up with newer elements relating to the current dance theme. 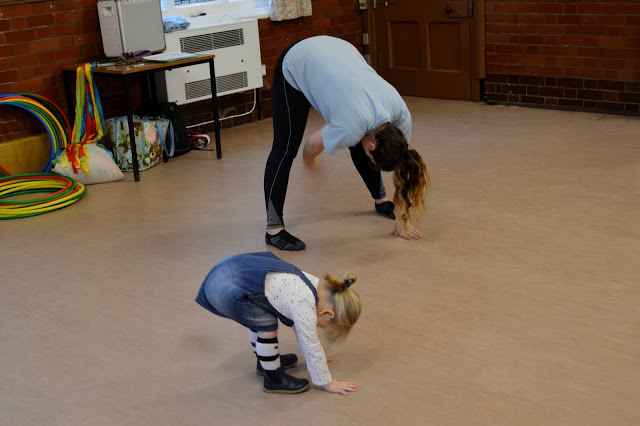 I love that this allows for your little one to feel secure and build their confidence with the repetition and familiarity whilst keeping it fresh and interesting and developing their dance skills with the newer themed tasks. In our welcome email it was explained clearly that at Amy’s age it is quite normal for the younger diddi dancers to take a little longer to settle and join in. If I’m honest I’d expected Amy to pretty much just get stuck in so I was a bit surprised that she spent much of her first lesson in my arms. 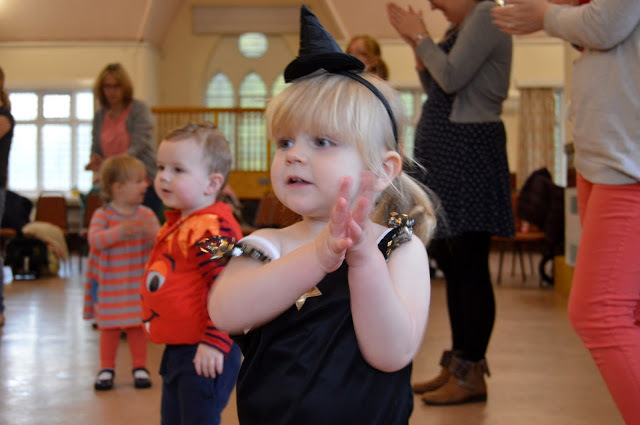 She was definitely overwhelmed by the whole experience though I suppose this is to be expected considering it was a new room, new people and a whole new experience – on top of this all the children were wearing fancy dress to celebrate Halloween! As the weeks have gone on Amy’s confidence has grown however she still spends much of her lesson glued to me and prefers to be held for most of the warm up activities. As soon as the equipment comes out though she’s like a different girl. Give her a pom pom or two and she’s all yours! This week, her fourth lesson, was the first time that she attempted to join in with a few of the warm up activities but she was still reticent. What I find quite interesting is that she’s quite happy to do the dance activities which come after the equipment has been put away. I think it would be really interesting to try the lesson backwards if that makes sense? I rather felt she wasted the first half of her lessons clinging to me but that if she’d been starting off with the pom poms and dance ribbons before moving onto the Jive moves she might have felt more confident about joining in. 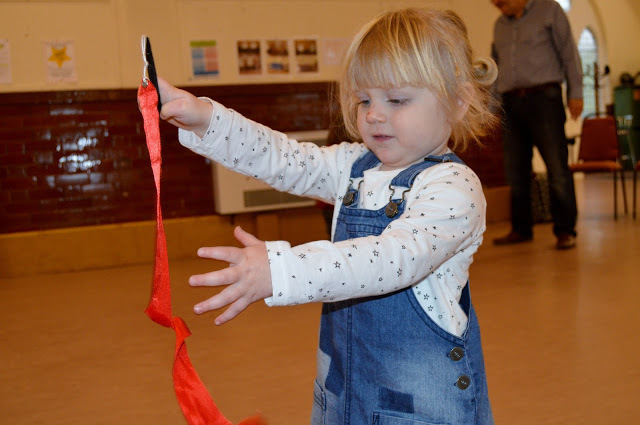 The class we have been visiting is a really small, quiet class which in some ways works well for little ones not feeling overwhelmed by lots of bigger, more confident children dancing around but it does mean that sometimes the room can feel a little large and lacking in atmosphere. I think it would have been really interesting to take Chloe along to the lessons too to see how she coped with them and also what sort of difference this made to Amy, unfortunately with her now being at school full time this wasn’t an option. Although there have been times where I’ve wondered if Amy was really that bothered by her dance lessons it has become clear that they have been influencing her when I’ve heard her telling her toes off in the car coming home or today when she skipped up the steps singing “It dancing day”. After 4 lessons I can see that her confidence has grown and I think if by Christmas she’d probably be happy to join in with most of the lesson rather than me trying to do it one handed with her on my hip! So I guess the real test of what we thought of our diddi dance lessons is – are we going to carry on going? You know what, at £6 a lesson, if it were on my door stop I probably would keep taking Amy but as it’s a half hour drive through traffic every Tuesday morning it’s a bit of a faff for us just now and with Amy due to start play group soon it will no longer fit into our timetable. If I were able to commit to a regular Saturday morning I’d definitely take both girls along for a trial. I think they’d love going together and this is certainly something to consider for the future. If you fancy trying out diddi dance for yourself you can book yourself a free trial lesson. I did dance classes from the age of 4 until I was 14. I loved them and only stopped because I knew I wasn't going to become a professional dancer and I needed to concentrate on mu GCSEs. 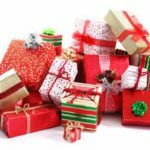 It really is a great activity for children of all ages. We did Diddi Dance when S was just 2 y/o for a few months as she loved dancing at home. At first she was really into it but then the novelty wore off and she just wanted to run around, climb on the chairs and do her own thing. I would have started again when she was 3 ish but by then she was doing ballet at nursery (and still does that somewhere else) so I decided to mix things up a bit and take her to Tumble Tots on our free days instead. I found that the classes (here) were a mix of ages 18months to 4 y/o and the older ones were able to follow the classes and I'm sure the younger ones were putting them off! Will just take my youngest to ballet at 3 if she wants to do that. I know others though that have adored DD and take their little ones until they started school. I find choosing groups and activities always come down to where the venue is and what day / time etc! Especially trying to juggle more than 1 child. Ah shes so cute! I think that dance classes are quite daunting for little ones aren't they. Although like you said over time it would be great for confidence. Oh I love this! Will have to see if we have diddi dance locally! Taylor did Diddi Dance at nursery and thoroughly enjoyed it! Wish they'd done regular classes when he was younger as we'd have gone often. This looks like a lot of fun! I have been wondering about what classes I could take my daughter to (she's 3) and this looks ideal! What a great class for little ones. I'm just in the process of signing my 5 year old up to street dance. I've never heard of Diddi Dance before but I really like the sound of lots of different dance styles rather than committing to just one. I've just started taking Toby to gymnastics but like Amy it's taking him a while to settle into it and I'm not sure the format is quite right for such young kids, we're going to stick with it for this block though and see how it goes. I'd love to take him to dance classes too one day though and Diddi Dance sounds like a great place to start. We have a Diddi Dance in the same hall I take the girls to music class and I've always wondered what it;s like. Thanks for the insight! Glad your little one is settling into it now – amazing how quickly they can gain confidence isn't it? This sounds great – in just a few short lessons it seems like her confidence has grown already and I'm sure she'll soon start loving the warm up activities too! I can't wait for my little girl to enjoy things like this. I'll be the crazy mum signed up to all the classes haha! Plus… she looks so cute in her halloween costume!! Awww this sounds like lots of fun! We go to a couple of classes on a regular basis and Boo always has so much fun!